Prof. dr. Harry van Dalen on Thomas Piketty’s “Capital in the Twenty-First Century”. The core of his claim is that we’re not living in a meritocracy because income inequality is too skewed to be seen or defended as a reflection of individual efforts. What’s more, wealth inequality is even more pronounced and things don’t look better for the remainder of the 21st century, as Piketty provides long-run evidence on the inequality between returns on capital and the growth rate of the economy. To counter the growing inequality and let the highest wealth owners support the welfare state, a modest progressive capital tax, preferably at the global level, offers in his view the best way to counter the negative effects of inequality. The previous has been recounted in numerous reviews and I will not reiterate these summaries as – and this surprised me – the book is really nothing more than this simple yet important message. It is refreshing that economists like Piketty get a lot of attention and even reach the ears of the ‘madmen in high places’. The book is well-written, and it has numerous nice quotes, which are almost forbidden to make in peer-reviewed journals nowadays. Usually the modern academic economist presents his ‘serious’ research in the format of introduction-theory-theorems-data-results-conclusions, preferably within a 5,000 words limit. However, Piketty is no such author and he takes his time to make his point. Still, one may wonder why it takes Piketty 685 pages to hammer down the above stated arguments. Marx is obviously a source of inspiration as he was also concerned with the consequences of the concentration of wealth. A simple explanation would therefore be that anyone who tries to trump the influence of Das Kapital must offer a grand view of society and a grand view costs a considerable number of pages. However, Piketty is quite a different character. Piketty worked at London School of Economics and at MIT , has written extensively in all the top core economics journals on issues of inequality long before his Capital, whereas Marx had a degree in law and was a self-taught student of economics with all the faults that come with such an education. Karl Marx was suffering from writer’s block and thanks to his colleague and friend Engels his work was published, while Piketty is a modern-day economist and they never suffer from writer’s block. However, Piketty does suffer from a different inconvenience: the inability to kill his darlings and not wonder off to another pet problem or argument. He could have used a good editor to make his point more forcefully and in about a third of the space that is allotted to him by his publisher. According to kindle statistics, no one seems to get past page 26 (of their e-book version) and this makes one wonder: who has really read the entire book? Still, in terms of effective communication, Piketty and Marx seem to have found their match, as Karl Marx struck a nerve by noting the growing pains of the industrial revolution and Piketty has struck a chord by putting inequality on the agenda, and has timed his book well. 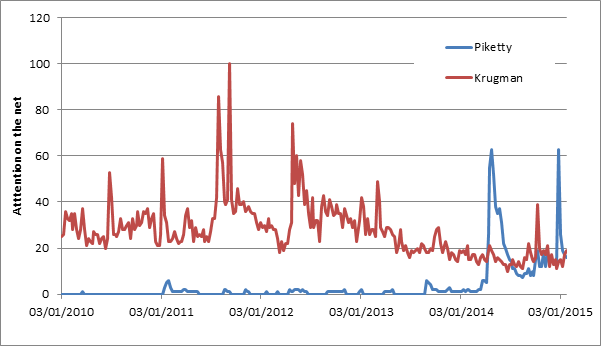 To see how powerful his rise has been just look at the search intensity on the internet (Figure 1) and compare that to the most visible economist of our time – Paul Krugman – and you must note that Piketty is Krugman’s equal, if not surpassed Krugman’s attention in the past year. This attention is well-deserved, because Piketty tries to present long-run evidence on the most crucial macroeconomic indicators of growth, capital and labor income, wealth and inequality. The first two parts of the book (236 pages) are a bit dry and dull for economists but apparently necessary “to draw from the past a few modest keys to the future.” (p.35) The book becomes really interesting once Piketty starts examining the rise of inequality on page 237. This is the type of research in which he has made his mark and without a doubt the statistics that he presents are thought provoking. Despite the importance of the subject and Piketty’s efforts in demonstrating income and wealth inequality, it is not only an extraordinary book but at some crucial points it is also a curious book for three reasons: (1) the return of laws in economics; (2) the lack of microeconomic foundations; (3) the curious use of historical evidence. Despite the fact that economists have tried for decades to get rid of the image of the ‘stone age economist’, the general public often thinks that economists use ‘laws’ to predict the future. To my surprise, Piketty bluntly states two laws, which he dubs fundamental laws of capitalism. One law boils down to an accounting identity and another law – which he calls ‘the second law of capitalism’ – is the inequality r > g: the return on capital (r) exceeds the growth rate (g) of the economy. As long as this inequality applies, it represents a powerful force for inequality. Economists, who employ dynamic general equilibrium models employ a similar condition and generally speak of such an economy as being characterized by dynamic efficiency. A condition signaling that it pays to invest, and by increasing the capital intensity the return might fall and come closer to the golden rule level of savings and investment. The curious thing is that Piketty turns this condition into a fixed law, which applies always and everywhere. Both the endogeneity as well as the volatility of the return to capital are issues that are swept under the rug by using long-run data with twenty-year intervals. And with this particular choice one misses the swings of interest of the public in the capital market. 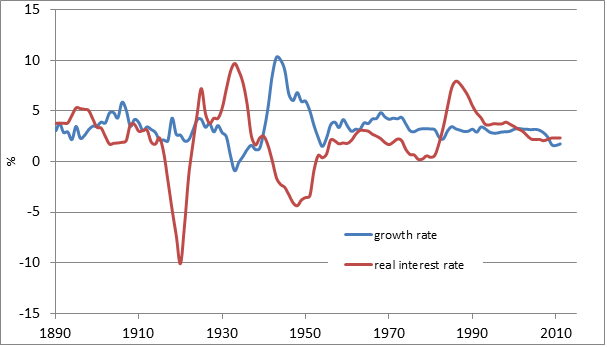 As an example, Figure 2 depicts the development of the real interest rate and growth rate for the US and as one can see the second law of capitalism (r > g) is not such trivial assumption after all. Although I am inclined to think that the grand history stories, which Piketty tells, are persuasive, I am not convinced that his laws of capitalism are equally persuasive and certainly no iron laws. The second curious aspect of the book is that the analysis of Piketty is a return to the ages when macroeconomics and microeconomics were completely separate disciplines. The general impression was that never the twain of those specializations shall meet. With the advent of New Classical economics the micro-foundations of macroeconomics were finally taken serious and this was later on shared by other schools of thought as well. But this book seems to depart from that tradition. Throughout the book, one would hope to get some microeconomic foundations of the so-called macroeconomic laws, but microeconomics is relegated to informed but informal discussions of what may be behind the macroeconomic findings of the book. And as a review by Lawrence Summers of the book suggests, this may well be the Achilles heel of Piketty. The predictions and developments which he sketches are not so certain at all. Piketty shows that an important part of the increase in inequality derives from increases in labor income and not capital income. He discards the marginal productivity theory of labor as a potential explanation, and builds his case for a progressive income tax on a bargaining theory in which top executives have found a way to generate ‘pay without productivity’, especially when progressive tax rates dropped during the 1980s and 1990s. According to Piketty (pp. 509-512) this “totally transformed the way executive salaries are determined.” Although there could be some truth in this argument, I would suspect that the pressure for executives to plea for higher top incomes would be even higher when the top income tax rates were also higher. The most curious aspect of the book of Piketty is that he uses a considerable amount of ‘evidence’ from 19th century novels. It is refreshing to have someone who has a keen interest in novels of Jane Austen and Balzac, tv series and movies, which may shed light on the phenomena under discussion. At first he helps to get the reader on board, but while struggling through the 600 pages, one gets the idea that Piketty views novels as really genuine evidence of what has happened in the 19th century. And at that point one would have wished that he had cast his eye on the large body of economic history, which offers more and more micro-stories of finance and welfare (just read the work of Jan Luiten van Zanden and his colleagues to get an impression of microeconomics of household finance in the very distant past). Still, the book is full of puzzles or statements which might inspire demographers. For openers, demographers could explain to him that the term ‘demographic growth’ – used throughout the manuscript – is a vague and useless term unless one specifies which demographic force is at work, fertility, mortality or migration. But on a more serious note, Piketty brings to the table a wide variety of long-run data on wealth inequality and developments in financial transfers. Especially chapter 11 (on merit and inheritance in the long run) is, in my opinion, a must-read. But demographers – both social and formal demographers – could employ their methods and ideas to shed a more nuanced picture on inequality. Throughout the book the author focuses solely on individual wealth and income, whereas it would be more appropriate – certainly in the case of wealth – to focus on the household or the family instead of the individual. What’s more, one might have thought that Piketty would pay attention to the development of homogamy and endogamy (Kalmijn, 1998), which could be a potentially strong force for the concentration of income and wealth in society besides the fall in fertilitydecreasing the dilution of inheritances within the family. On a more general note, there is a considerable amount of work done in social demography , which brings to the fore how norms and values are transferred within families and indeed this type of work may complement the work of Piketty as well as inform him and his followers. Finally, taking the long view, one should be aware that the interaction between macroeconomics and ageing is not a cut-and-dry subject. For instance, according to Lee and Mason (2010) the future of an aging economy may perhaps be seen with some anxiety. They also show that besides the traditional demographic dividend – the benefits arising from improving support ratios in the middle of the demographic transition – there may loom a second demographic dividend: the increased demand for life-cycle wealth (capital assets) as populations grow older. In short, population aging can lead to an increase in physical and human capital per worker, which as Lee and Mason claim, “could overwhelm and reverse the negative effects of population aging working through support ratios” (p. 169). However, this increased demand for wealth can also be satisfied by familial and public pension transfers to the elderly. One of the messages which Lee and Mason bring across is that institutions matter crucially for determining the long-run consequences of population aging. Certainly, for countries in transition like China and India, which are expected to become prominent members in the world economy, the way aging will affect the world capital market is not a clear-cut prospect and demographers with the eye for reality may offer a counterweight to Piketty’s long view. Piketty has much to be proud of. A mass of long-run data is presented in a consistent way documenting the development of capital and labor income as well as inequality over time. However, his long-run view is not based on the inner workings of households and firms. This aspect, as well as the lack of institutional change can generate a prejudiced view of the future. To trust his long-run view one has to trust his iron laws of economics. And at this point, the book presents a possible future which may very well suffer from blind spots. But then again, Piketty may find himself in good company as the history of economic thought is full of errors and blind spots, which have been the inspiration of future economists. Perhaps, the inspirational force of his book may very well be its prime contribution. Prof. dr. Harry van Dalen is affiliated with Tilburg University, Department of Economics, the Netherlands Interdisciplinary Demographic Institute, and the University of Groningen. Demotrends would like to thank and acknowledge Harvard University Press for providing us Piketty’s ‘Capital in the Twenty-First Century’ for review purposes.